The tachometer indicates the approximate number of engine revolutions per minute (rpm). Use the tachometer to select the correct shift points and to prevent lugging the engine and/or overrevving the engine. The tachometer pointer may move slightly when the ignition switch is in ACC or ON position with the engine OFF. This movement is normal and will not affect the accuracy of the tachometer once the engine is running. 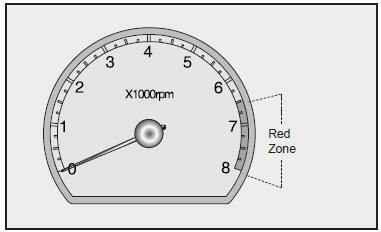 Do not operate the engine within the tachometer’s RED ZONE. This may cause severe engine damage.